Despite being partially in ruin, the temples still looked magnificent. Shawn and I passed scenic moats, Buddha statues with golden fingers as tall as a human, and twisted tree roots resembling a braiding project gone beautifully awry. We encountered a couple posing for wedding photos. The bride wore an elegant, buttercup-yellow outfit made from silk. We marveled at the temples’ architectural details, including ornate prangs, weathered columns, and three-dimensional elephants. 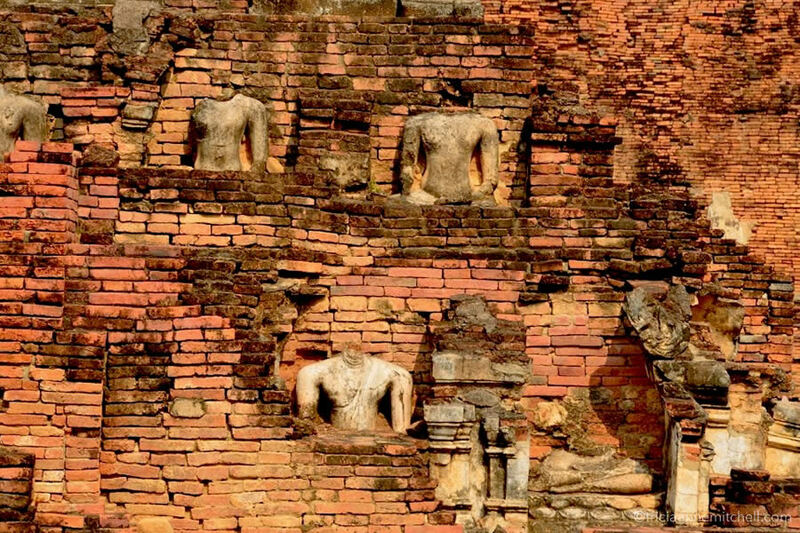 Though each temple had its own character, the reddish-orange bricks used to build them were a unifying feature. Trying to combat the sweltering temperatures, we downed chilled water with a fury. When we spotted a man selling popsicles and ice cream from a tiny cooler, we couldn’t resist the sweet indulgence. Just as we were savoring our chocolatey ice cream bars, a pick-up truck appeared, seemingly out of nowhere. 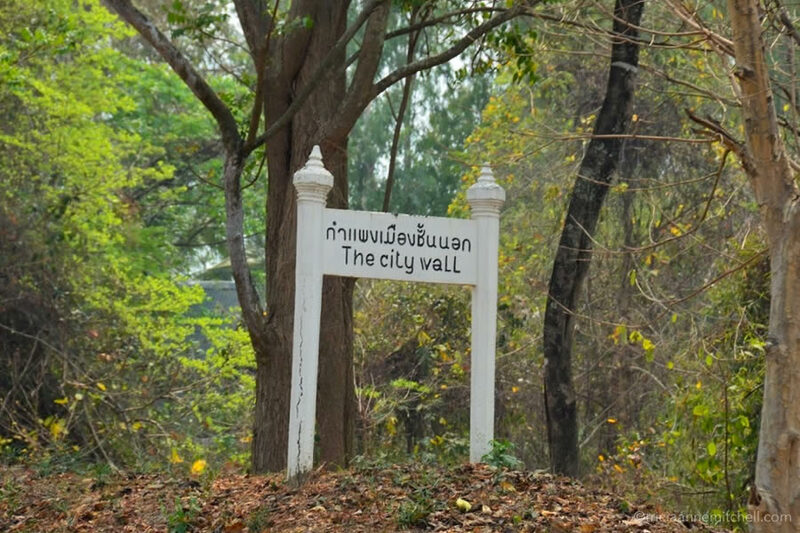 It pulled over on the roadside near us and a police man – or perhaps a park security guard – hopped out, speaking only Thai, but wearing a uniform and a wide grin on his face. Embarrassed by the ice cream smears on my face, and my hopelessly sticky hands, I tried to make the rapidly-melting dessert in my hand less obvious. The man didn’t seem to notice, and he enthusiastically gestured to his phone. Through mimed motions, he ‘asked’ if we could take a picture together. We obliged, and after he’d snapped the smiley selfie, he opened his Google Translate app, trying to express more complex greetings. However, the app’s English translation was incomprehensible. Before he hopped in his car and drove away, he playfully grabbed Shawn’s thigh, as he made a ‘strong’ gesture with his arms. And then he was gone. We were both amused and perplexed by the encounter. It was only later in the day, when we met a pair of English-speaking locals, that we understood what the gregarious man had been trying to convey. This pair expressed how surprised they were to see us exploring the historic park on foot, and not using bikes on such a sizzling day. “You have much energy,” they said. Indeed, as evening approached, the locals’ comments about feeling fatigued on such a hot day created a self-fulfilling prophecy of sorts. By this time, all we could think about was a refreshing shower, and our air-conditioned hotel room. But one last highlight awaited us in Sukhothai — seeing the sun set behind atmospheric Wat Mahathat. As the mandarin-rimmed orb dipped behind the now-silhouetted temple, the entire sky turned a sherbet hue. Birds soared overhead. Calmness reigned. Summoning a burst of energy, while wanting only to savor the tranquil scene, we scurried off to catch the day’s last songthaew (shuttle). 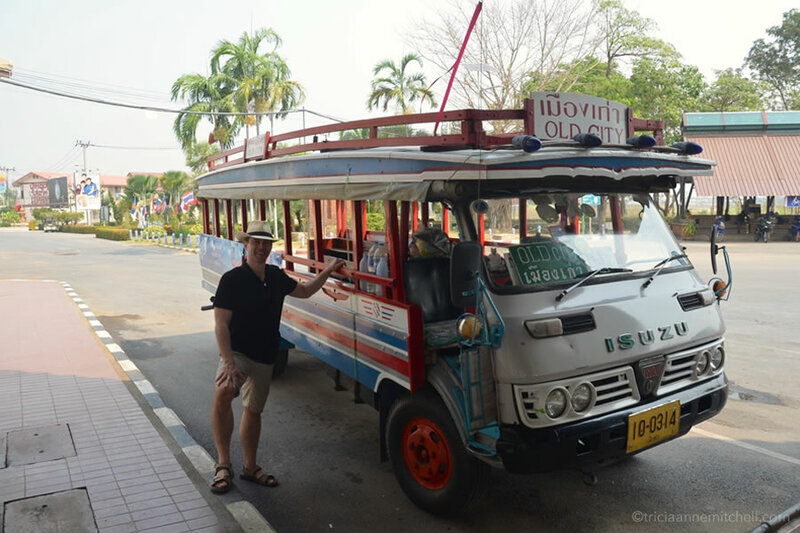 Shawn stands next to the shuttle (songthaew) that goes from Sukhothai’s bus station to the historical park. A thrilling ride complete with wooden floors (left) and glimpses of traffic (right). 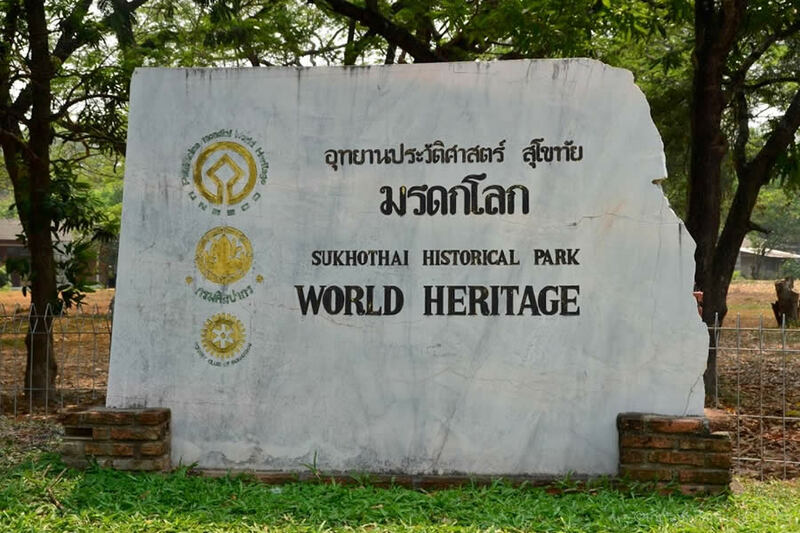 Sukhothai’s Historical Park has been a World Heritage Site since 1991. Tangerine-colored blooms frame Wat Mahathat, which dates back to the 13th century. This is Sukhothai’s largest temple, and arguably one of its most atmospheric. 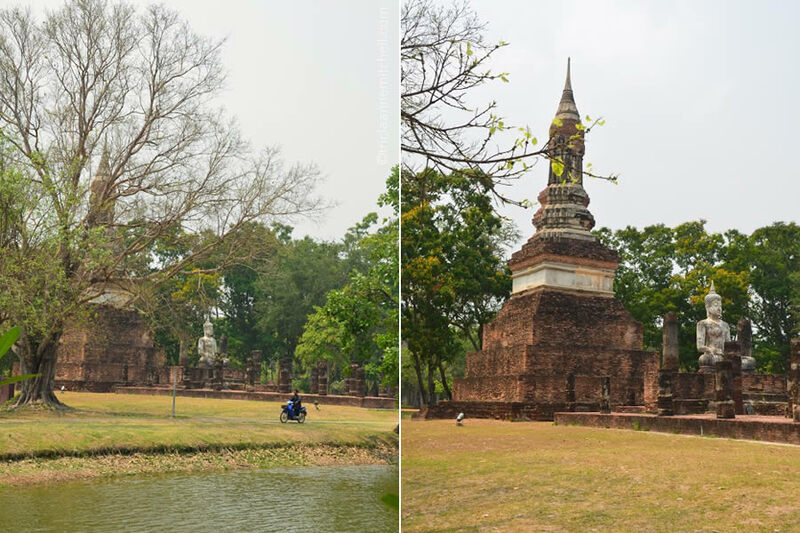 Monumental architecture (left) melds with handsome old trees (right) to create a special atmosphere at Wat Mahathat. The temple is also surrounded by walls and a moat. 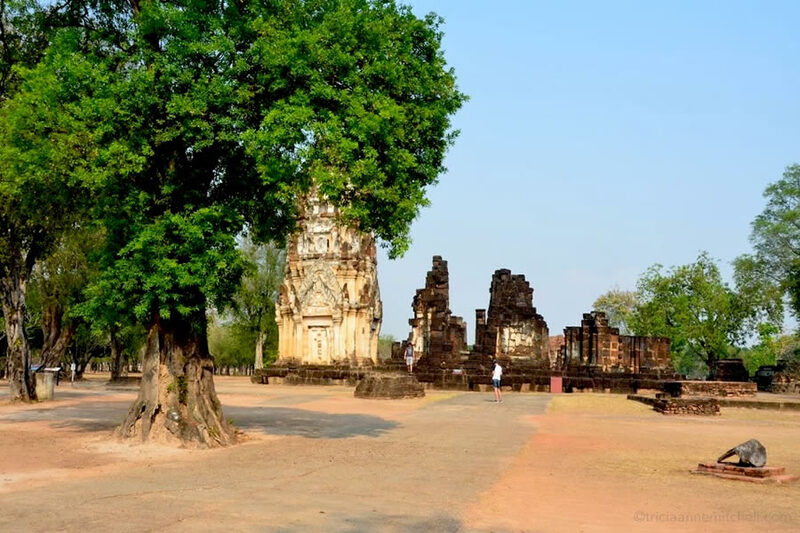 When it was first constructed by the Khmer people, Wat Si Sawai served as a Hindu temple dedicated to the deity, Shiva. Today, it is a Buddhist temple. 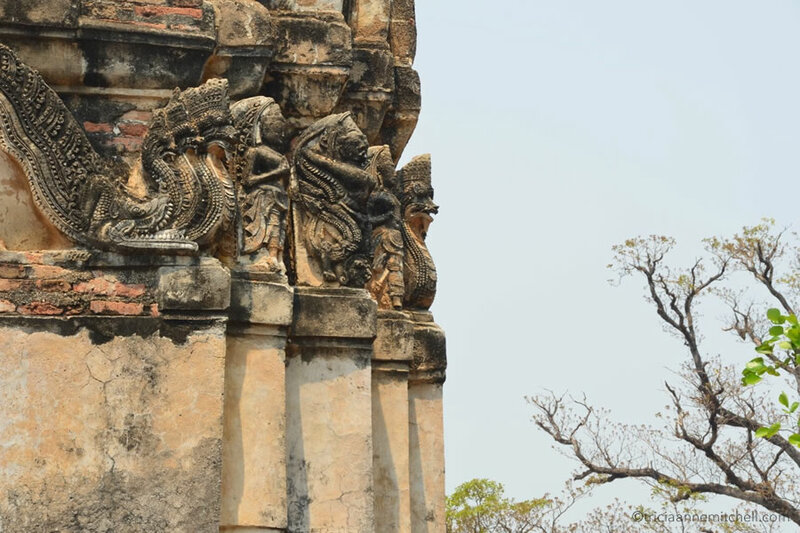 Serpent-like creatures on one of the prangs of Wat Si Sawai. 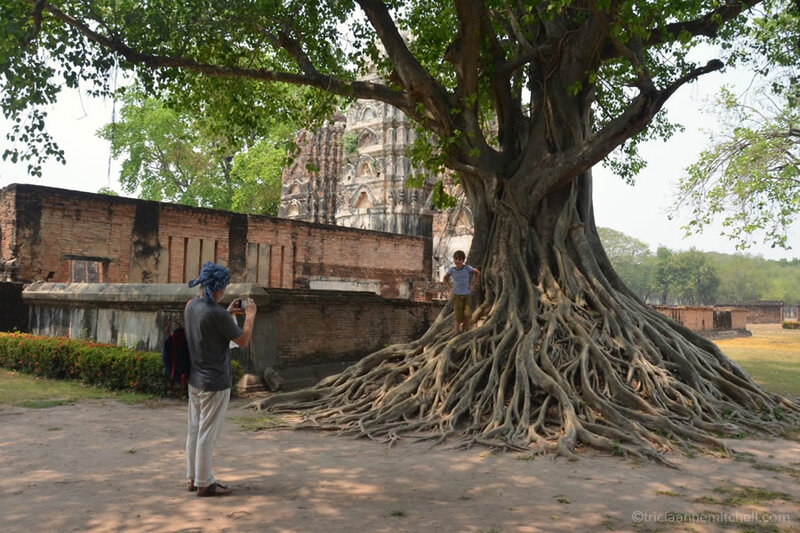 A boy climbs on a mass of entangled tree roots at Wat Si Sawai. A man rides a motorbike past the 14th-century Wat Traphang Ngoen (left). A seated Buddha statue at Wat Traphang Ngoen. The scenic bridge leading to Wat Sa Si. 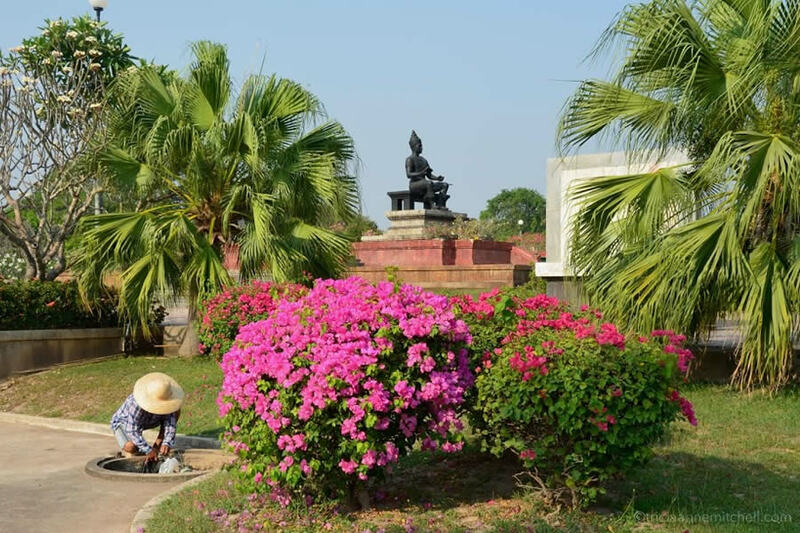 A woman rakes foliage from the lawn by Wat Sa Si. Her school-age daughter frolicked on the grounds while she worked. The Buddha statue at Wat Si Chum appears to peek through an opening in the temple. Wat Si Chum is located outside of the old city walls. 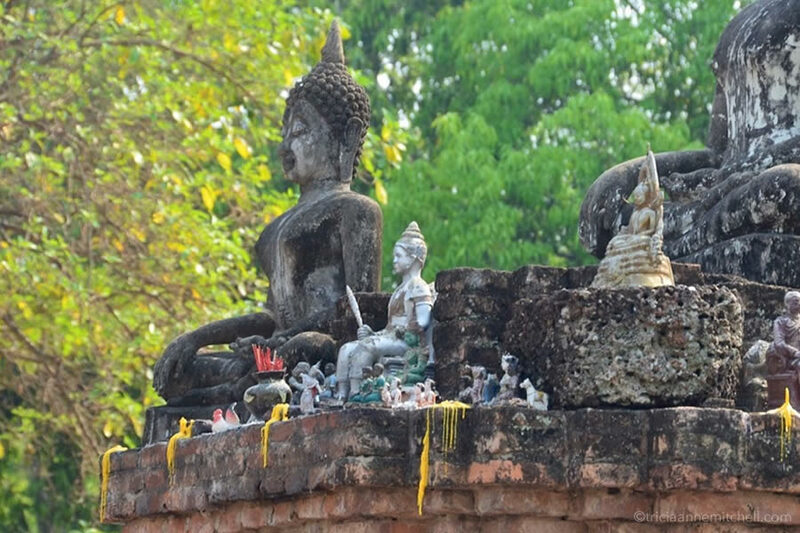 Wat Si Chum’s Buddha statue (left) is one of the largest in Sukhothai. This handsome tree with a twisted trunk (right) is located on the grounds of Wat Si Chum. 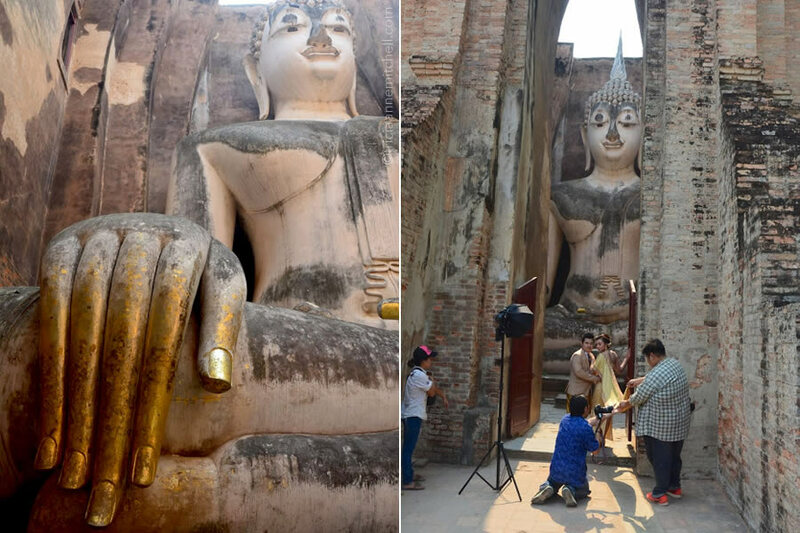 Wat Si Chum is well known for its Buddha’s elegant, elongated fingers. Offerings left at the base of the Buddha statue. Despite the sweltering temperatures, this couple looked cool and calm during their wedding photo shoot. 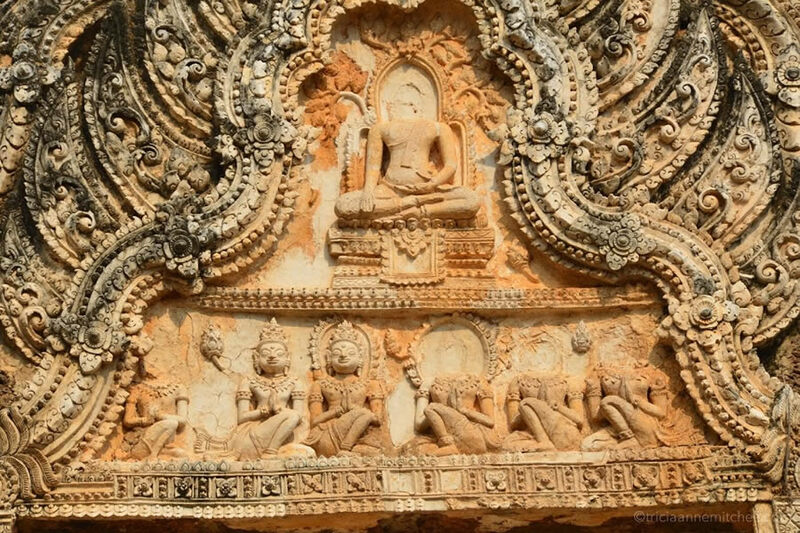 Wat Phrapai Luang is one of Sukhothai’s oldest structures and was originally dedicated to Vishnu, a Hindu deity. 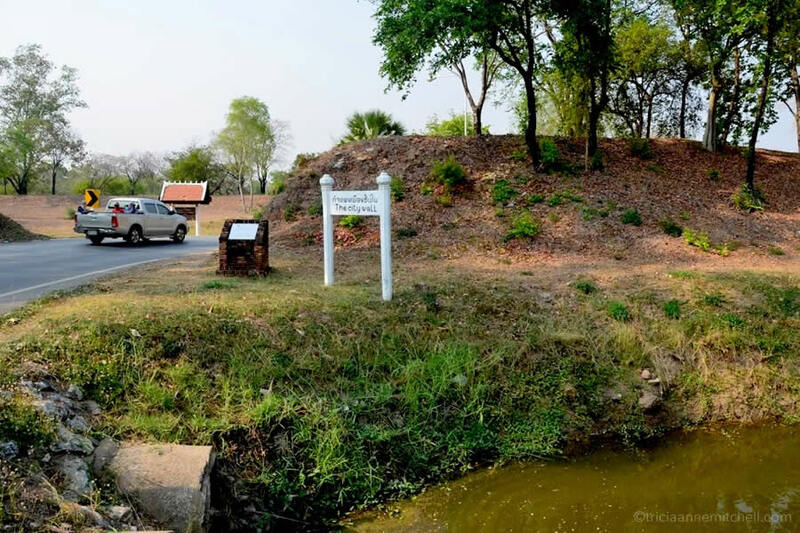 Like Wat Si Sawai, it is believed that Wat Phrapai Luang was built by the Khmer people before the Sukhothai era. The complex was later converted to a Buddhist temple. 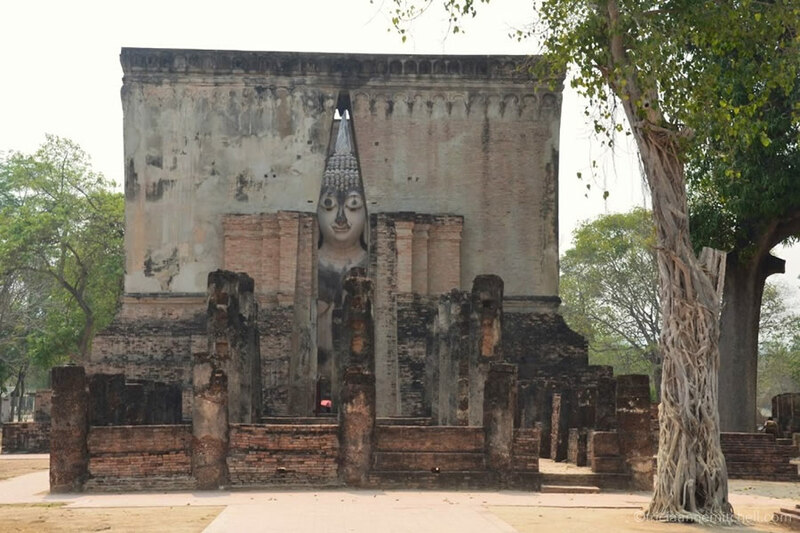 With its partially-ruined appearance, Wat Phrapai Luang is one of Sukhothai’s more atmospheric and enigmatic temples. 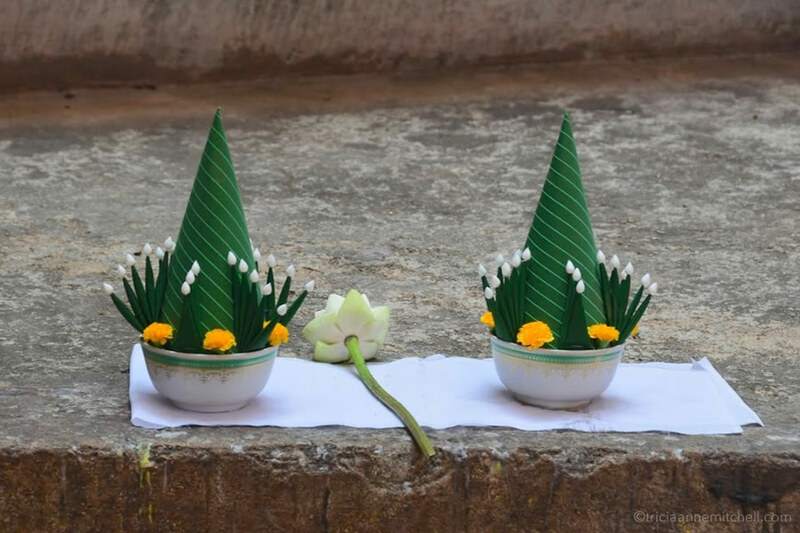 Offerings and melted candle wax mingle at Wat Phrapai Luang — evidence that the temple is still visited by worshippers. Detail of Wat Phrapai Luang. Heading back into old Sukhothai, through what would’ve once been the old city walls. Twenty-four elephants surround the chedi (or stupa) of Wat Sorasak. A gardener tends to the landscape around the King Ramkhamhaeng Monument. Riding the songthaew at sunset. 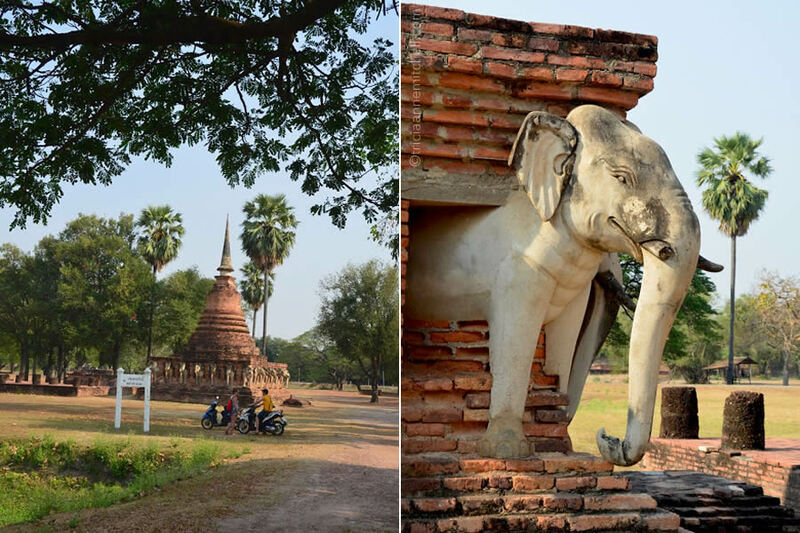 Sukhothai is located about 430 km (265 miles) north of Bangkok. Chiang Mai is 310 km (190 miles) north of Sukhothai. 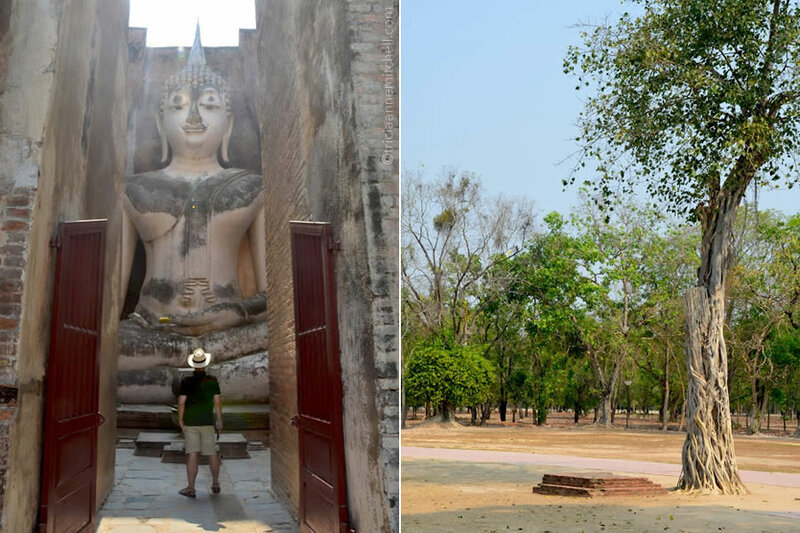 We spent one full day exploring Sukhothai’s historical park, visiting temples in the Central Zone and the Northern Zone. An adult ticket for each zone cost 100 baht. Since we knew we were only going to be staying two nights, we wanted accommodation near Sukhothai’s bus station for easy access. 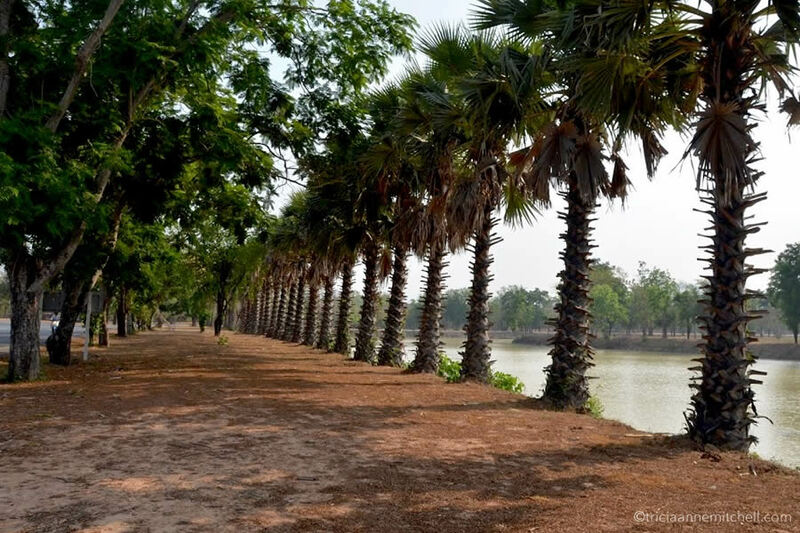 We spent two nights at the Rueangsrisiri Guesthouse 2 (affiliate link). The owners were nice, and our room’s interior was brand new – complete with a showy rhinestone headboard. Small restaurants nearby offered tasty breakfast and dinner options (we opted for Thai fare). One night, we walked to Sukhothai’s night market for dinner. Though not as cosmopolitan as night markets in other Thai cities, it still had many stalls to choose from. After dinner, we chose to take a tuktuk back to the guesthouse because of some feral dogs near the outskirts of the night market. If you’re staying in a guesthouse near Sukhothai’s bus station, there is a shuttle (songthaew) at the bus station that’ll take you to the historical park. When we were there this shuttle was a vintage Isuzu with an ‘Old City’ sign on top. A one-way ticket cost 30 baht. We rode this songthaew back and forth. 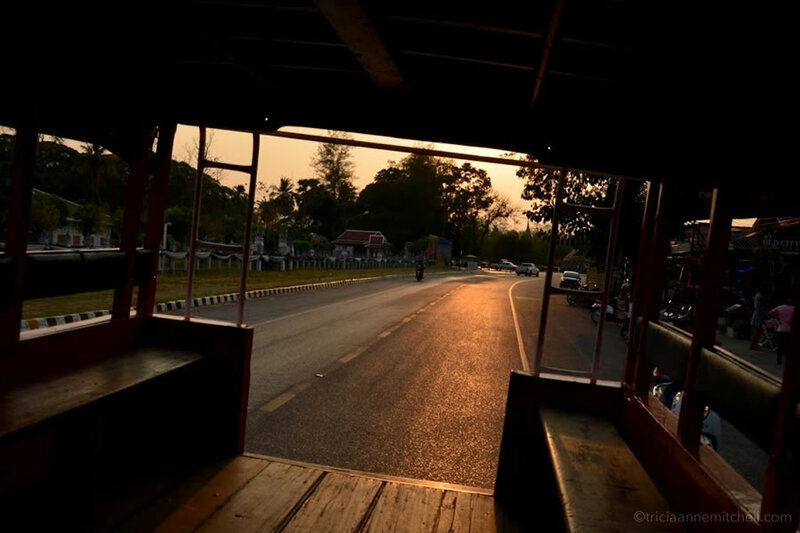 We took a bus from Ayutthaya to Sukhothai, and the journey took about 5.5 hours. Our first-class seats were a nice splurge, and we were given a boxed snack, including coffee and a brownie. One ticket cost about 500 baht, but this amount also included the tuktuk fare to get to the bus station. For simplicity’s sake (we were not staying near the bus station), we had our wonderful hotel owner in Ayutthaya arrange our onward travel to Sukhothai. She added a fee, which was built into the total ticket price. The tickets would have cost less had we bought them directly from the bus station. After Sukhothai, we headed to Chiang Mai. The bus trip from Sukhothai to Chiang Mai took about 6 hours. Since we were staying at a hotel close to the Sukhothai Bus Station we were able to purchase our bus tickets directly. One bus ticket was 207 baht. Looks like an amazing visit. This temple is quite something. Your photos and video, as always are incredible! Hi Darlene, with only two weeks in Thailand, we were uncertain if we’d be able to get to Sukhothai, but it ended up being one of the highlights of our trip. Having only tiptoed into two of its five zones, it looks like we have much more to explore. Shawn will be happy to hear that you enjoyed his video, too! Thanks for the kind words. Interesting Post. If you want to see the Sukhothai Historical Park 700 years ago, I just finished building my Time Machine; I can email it to you. Do you have access to a 3D printer?? Thank you, Bobbi! Here’s hoping our paths will intersect someday soon. I remember one of your last big trips was to China. What else is on your radar? I’m a bit ashamed to admit that despite having been to Thailand three times, all of my visits were limited only to Bangkok. 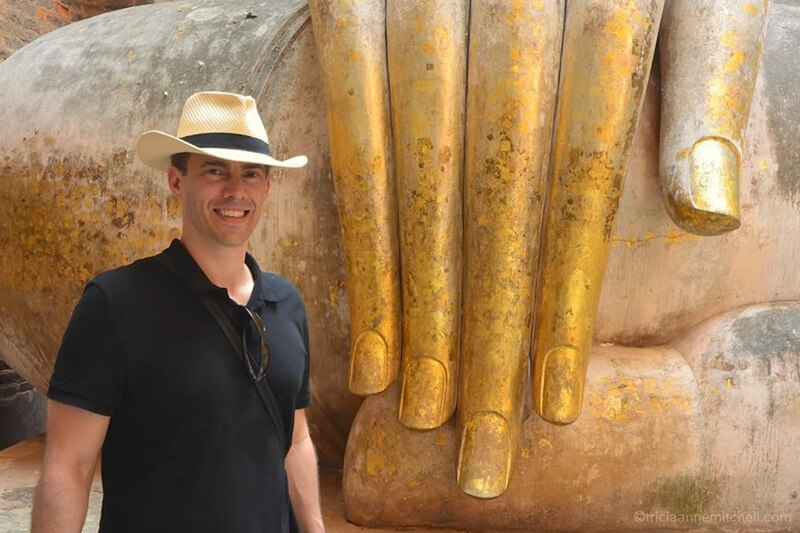 I’ve been dreaming to see the country’s ancient sites — Ayutthaya, Sukhothai and some lesser known ruins — but for some reason I always end up booking flights to countries other than Thailand. This post reminds me that I really should return and allocate enough time to explore those sites. Bama, no shame for haven’t gone elsewhere in Thailand yet. :) Like you, we’d been to Bangkok a few times, but never made it out of the city. Instead, we just checked out some of the local attractions and used Bangkok as a jumping-off point for other countries in the region. 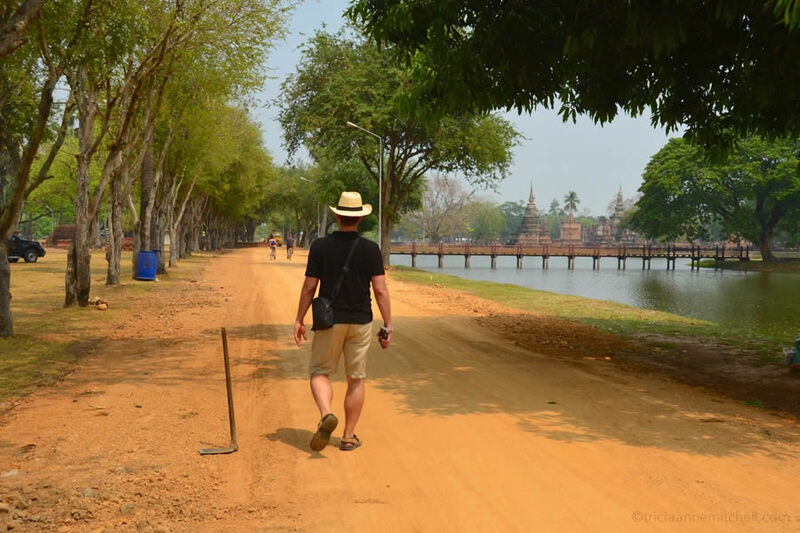 This last trip, however, we were able to squeeze in a fair amount in 2 weeks, and not feel too hurried: Bangkok sites, Ayutthaya, Sukhothai, and Chiang Mai. Of course, there’s still more we want to see, but it’s nice to have an excuse to return. I hope you’ll get back soon! Dear Tricia and Shawn, your post is so beautiful and inspiring, as my mind and camera is desiring for a trip to Myanmar with a first stop in Thailand, hopefully next year. As a Buddhist I want to photography as many Buddhist places as possible, yet not necessarily the main stream tourist places. If you ever have any suggestions please let me know, yet I am aware that your time is limited for such a request. Happy travelling to you both. Cornelia, I’m happy to hear that you found the post inspirational! 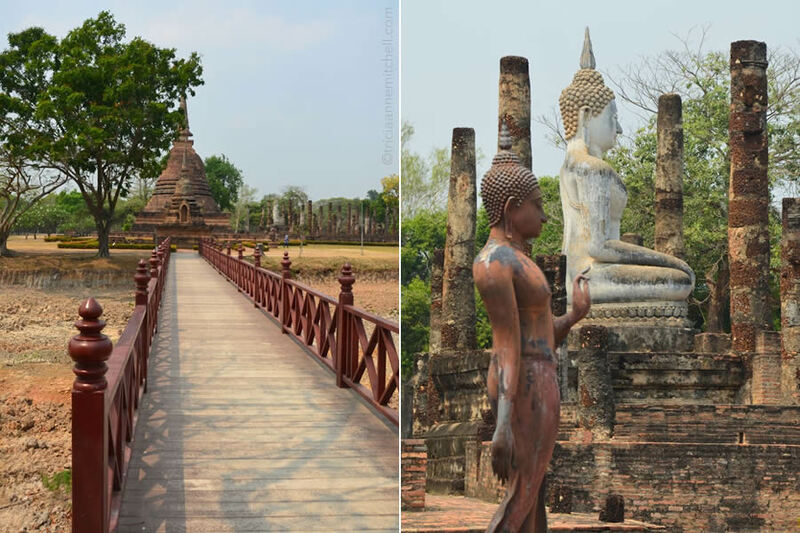 As for recommendations in Thailand, we really enjoyed Sukhothai and Ayutthaya. Ayutthaya is closer to Bangkok. 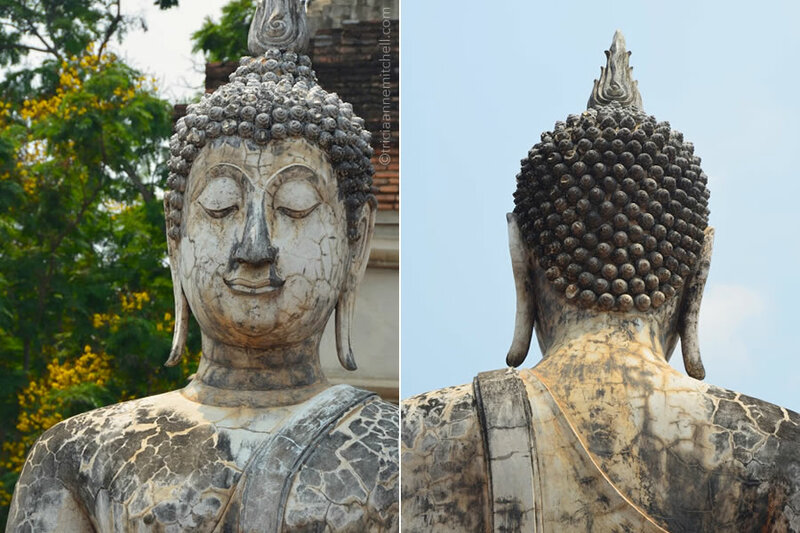 At one of Ayutthaya’s many temples, a Buddha head emerges from the tree roots. 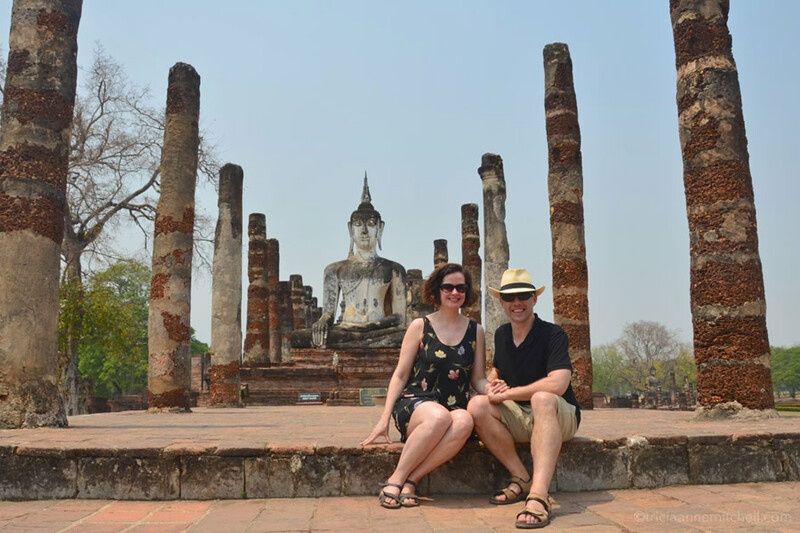 This is a pretty popular site, but we still enjoyed exploring Ayutthaya for two days. Bangkok and Chiang Mai, of course, have so many atmospheric temples, too. We have wanted to go to Myanmar for some time, but haven’t made it yet. Bagan looks incredible. 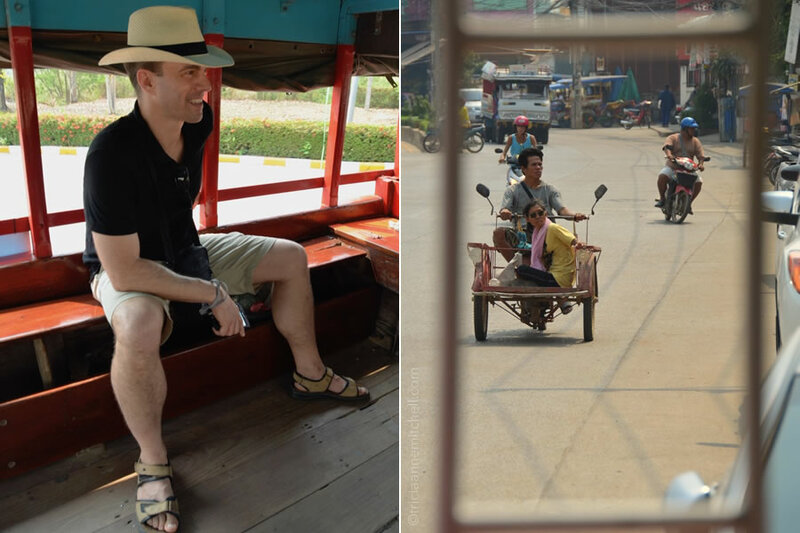 Do you think you’ll have time for Laos, Cambodia, or Vietnam? And, are you headed to Germany any time soon? What an amazing experience and you describe it so beautifully. I am reminded of my own wanderings around the ruined temples of Siem Reap in thick tropical heat, feeling as if I were in a movie. Sukhothai looks like a place I would fall in love with. I do hope you’ll have the chance to explore Sukhothai soon as you would really do it justice through your elegant writing and photography. I have the impression that so many travelers to Thailand skip over Sukhothai — preferring instead to fly directly to Chiang Mai from Bangkok. It took a bit more effort to get here (train to Ayutthaya — another great archaeological site, then a bus to Sukhothai, then an additional bus to Chiang Mai) but it was so worth it. I have long admired your explorations of lesser known places and your deep dive into the destinations you tour. I did visit Banteay Srei. Its miniature pink ruins were a magnet for selfie-lovers. But when they ran off, I got the chance to gawk at the incredible artistry that survives on lintels and pediments. It sounds like you had a fun day despite the heat. I can just imagine the scent of the frangipanis in the air. Carol, yes, an enthusiasm for these gorgeous sites, coupled with some iced coffee and ice cream helped us to forget about the heat. :) Do you have frangipani in your part of Australia? The first time I ever saw them was in Southeast Asia, but perhaps that’s because I grew up in an area with a continental climate. Yes, frangipani grow here quite well. They have a beautiful scent. Wow! That was very interesting. It’s very different from anyplace that I’ve ever been. Good to hear from you, Gerard! (I know it’s been a while since I’ve posted here.) How’s NY? 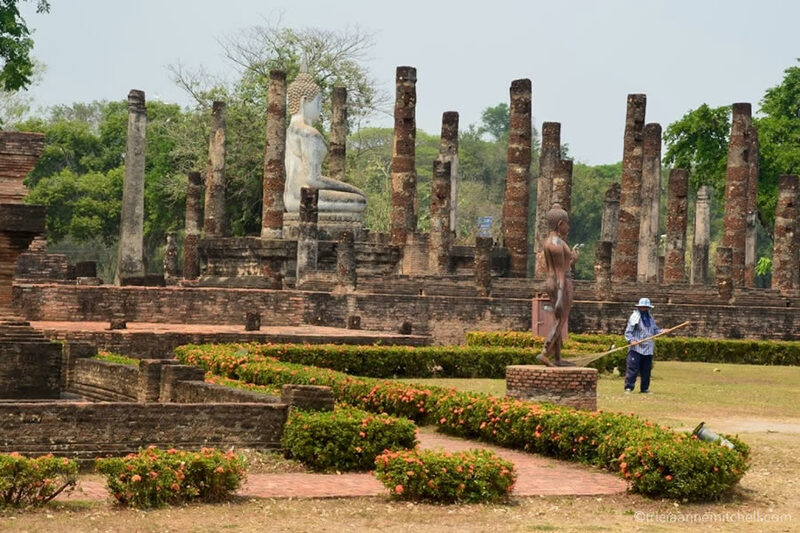 This was only the second archaeological park I’ve been to in Thailand, but I agree with you that Sukhothai’s a fascinating site. I certainly have to learn more about art history in the region. What a calm and serene place of respite! Thanks for sharing such a lovely and detailed post and the great video off course. Always loved reading about these beautiful historical places in Asia (thanks to our history books and teachers in school) although am yet to visit any. Can’t thank you enough for bringing my desire back through this post. Absolutely loved it! 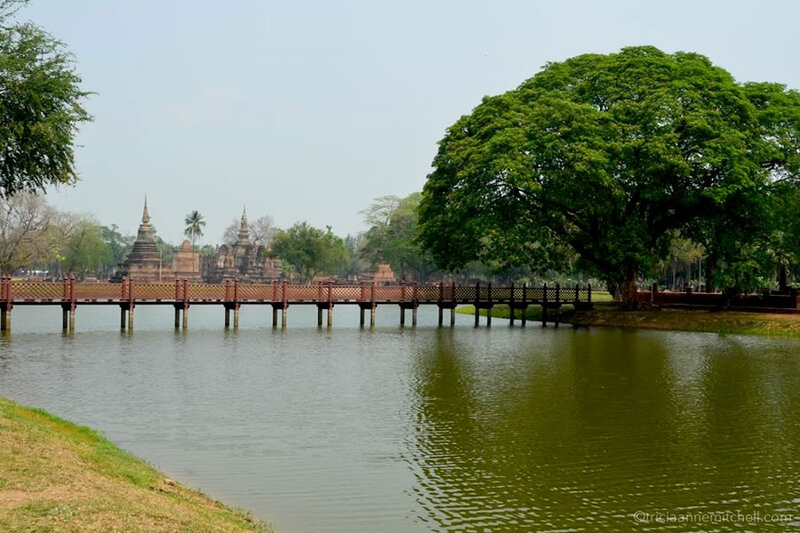 Sayori, it’s great to hear that this glimpse of Sukhothai reignited your interest in visiting historic spots in Asia. I also studied some of these places in an Asian art class, but it took a decade before I started exploring them. Where in the world is home for you? 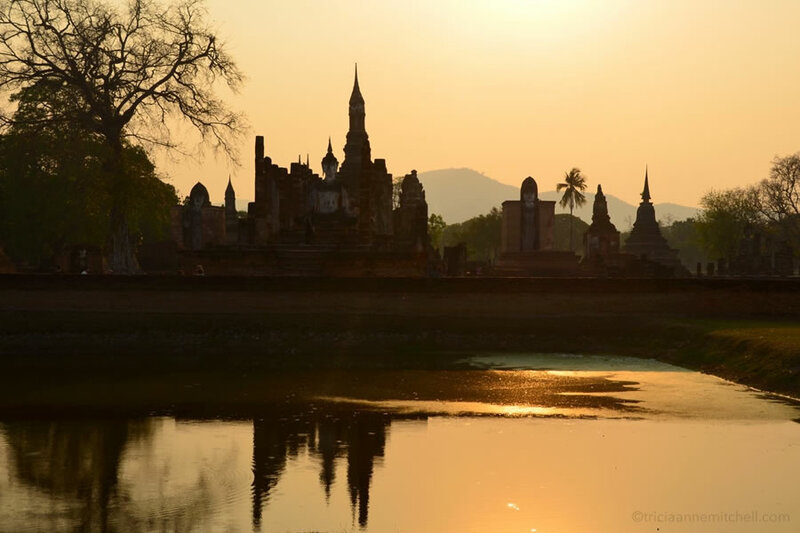 Fantastic photos and summary Tricia ~ one day I hope to visit Sukothai myself. Cheers to a great spring ahead. Fantastic pictures of a beautiful place. I can almost feel the sweltering heat in that hazy orange light through those pictures, too! Thank you, Henry! We had some similarly sizzling temperatures in Montenegro a little over a week ago. Well, not quite as hot as Thailand, but the unseasonably warm weather did catch us by surprise. Here’s hoping you’re having a wonderful time in Germany and Austria.